For every unit of damage Xiahou Dun receives, he can do a judgment. If it is red, he damages the player that hurt him one. If it is black, Xiahou Dun discards a card from the player that hurt him. 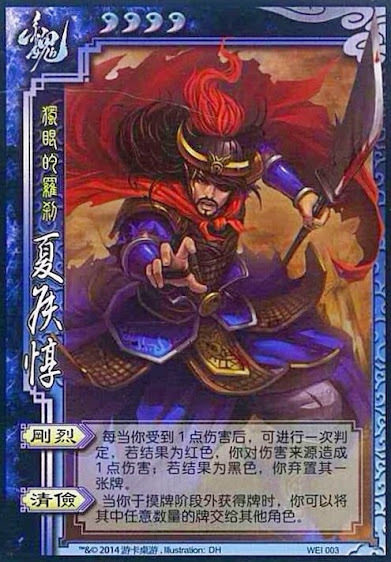 Whenever Xiahou Dun receives cards outside of his turn, he can give the cards he gets to any other player. Xiahou Dun can now use "Unyeilding" for every unit that he gets hurt. If the judgment is black, then he gets to pick which card is discarded. Xiahou Dun can only give away the cards that he received with "Frugal". He cannot keep the new ones and give away older ones. If he gets more than one at a time, he can keep any number of them and give the others away as he pleases, much like Liu Bei's "Kindness".